It’s the first night of camp and the natives are restless. Wisdom dictates that before they get too wound up, we cover the basic do’s and don’t’s of co-ed, middle school, church camp. DO drink at least four bottles of water every day. DON’T go onto the neighboring golf course. DO mix it up and try to meet new people. DON’T bring food into the sleeping areas (rodents – ick). And so it goes. It’s pretty much what you’d expect to have to say at the beginning of a week with dozens of tweens and teens whose parents are absent and whose decisions are most often based on what their peers think they should do. Always groans. Always giggles. A few ‘yuck!’s and lots of whispering with their friends. Because when you’re 13 going on any maturity level, purpling is a bad idea. And at church camp, it just isn’t allowed. PDA is at the root of many a battle between kids and their parents (newsflash, folks – PDA isn’t just a handheld device). Many a young person has found him/herself in at least a bit of hot water over their public displays of affection. PDA might be as seemingly benign as holding hands, but whenever pink and blue connect, purple is made. And we teach our kids that, at least for them and at least for now, purpling can wait. But what about when pink and blue grow up, get a job, get a life and get married? Do the jr. high ‘No Purpling’ rules still apply? Today is Valentine’s Day, and many of us are celebrating the life-connection we have made with one who knows how to bring out the purple in us! We buy flowers and chocolate, enjoy dinners out and evenings in with this one who has captured our heart and co-created a life worth sharing. But are we purpling for ourselves, or for the glory of God? Displays of affection, when self-serving and driven by relentlessly emotional tides, rarely consider anyone but their own pink and blue. In their frantic efforts to sustain a purple ‘high’ they end up alienating the life that goes on outside of their little purple paradise. So often, instead of our love taking root and blooming gloriously in the garden, we grow smaller and narrower until we’re no more glorious than a beet, hardly peeking out from beneath the soil, keeping all of the fruitfulness of our relationship hidden from the Gardener and the rest of those growing there. Where we ought to be displaying publicly the beauty of God-given love we opt instead to minimize or secularize the sacred shades of purple, trading them in for a cookie-cutter version of the relationship flavor-of-the-month as decreed by the ‘church’ of pop culture and media. The sad fact is that what our world sees as purple is a fake and a fraud – a counterfeit color on a hijacked palette of knock-off shades. It’s the world’s purple that we warn the campers about. Purple that’s hot. Illicit. Edgy. Risky. Selfish. Non-committal. Temporary. Purple that misuses pink and takes blue for granted. Purple that trivializes the art of connection. 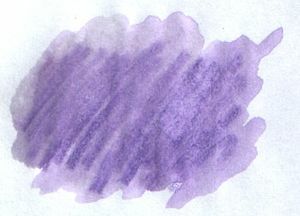 Purple that stains and discolors and bleeds out in the wash.
God’s shades of purple aren’t like those we see on the streets and tv screens of our world. God’s purple is rich and deep, eye-catching and multi-faceted, a color you can paint a life with. A color that this dismally grey world desperately needs to see. When we live our love in front of the world, we lend one of God’s most breath-taking colors to the ongoing art of our lives. How we live our purple points others to a Love who is able to take my marbled pinks and your muddy blues and blend them in such masterful, powerful ways that the resulting shade – when it reflects the Son – creates hope. And passion. And joy. Purpling for the glory of God is my friend Ellie, holding the hand of her husband whose hospice care dictates that their life together is about to change. Purpling for the glory of God is a teary-eyed Brian holding onto his bride of more than 20 years before closing the car door and heading toward his distant worksite. Again. On this Valentine’s Day, think twice before publicly displaying your affection for the spouse that you love. Think twice, and think purple. This entry was posted in PINK Tuesday and tagged Glory (religion), Marriage, mature love, public display of affection, Purple, Religion and Spirituality, Valentine, Valentines Day by Pink Shoes Ministries. Bookmark the permalink. Mary Ellen – I think of you and Don as I consider those whose ‘purpling’ has colored my world… You are TRULY a GIFT to your family and friends!